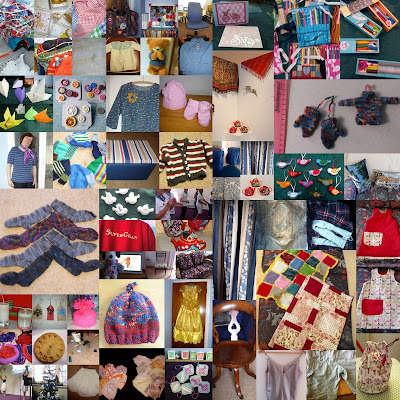 And finally, a collage of the whole year's output. I suspect there are a few crafty bits which have escaped the camera - but nevertheless I feel happy with this lot. I may not be in paid employment at the moment, but nobody could say I am sitting around twiddling my thumbs! I am not sure which project has been the most satisfying. I've loved making garments for others [especially Rosie], and greetings cards for friends, and home renovations...but I suspect 2016 will be marked at the year in which I actually got to exhibit some of my work in a pukka textiles exhibition in Norwich Cathedral. Now I really can call myself a craftswoman! 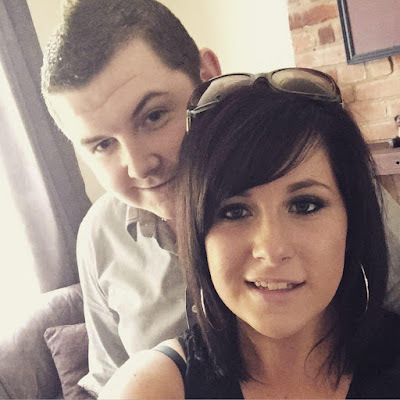 Unfortunately the family has been hit by sickness this week, right, left and centre. Coughs, asthma, DIY injuries - and worst of all, Steph and Bob have been laid low by the novovirus. 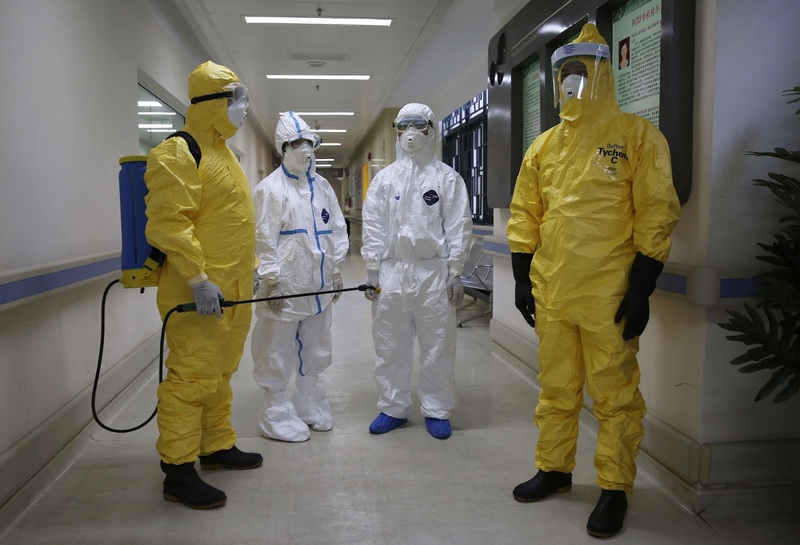 Plans for weekend get-togethers are all on hold, and I am praying that Rosie escapes anything nasty. It is hard enough being ill in your 30s or 60s - worse when your age is still measured in months not years. Much as I admire Florence Nightingale, the only traits we truly share are those of mathematics enthusiasts and fondness for pie charts. I am not a particularly good sick nurse. But I love them and I do my best [ 3am is not the optimum time for me to dispense sickbowls, glasses of water and TLC] I am thinking of getting out the sewing machine and running up a costume for myself. 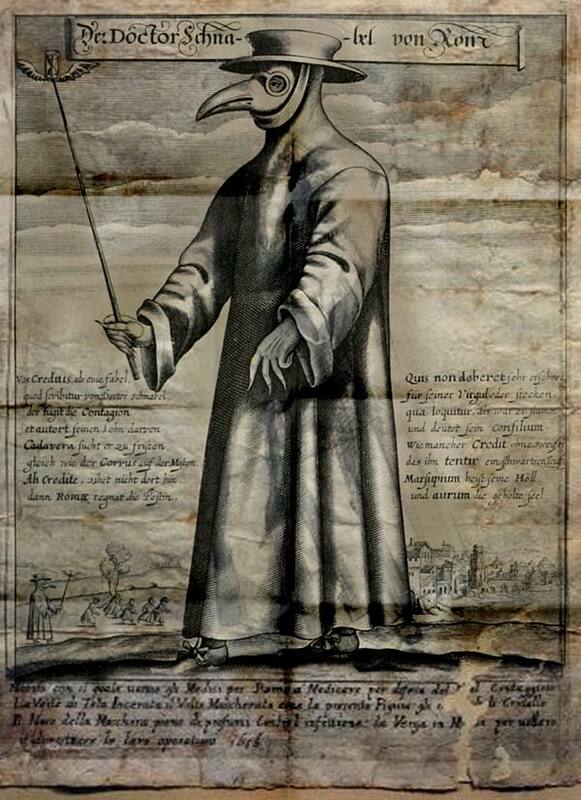 These Plague Doctor Costumes look scary but there was a lot of sense behind them, at a time when germs and infection were not properly understood. 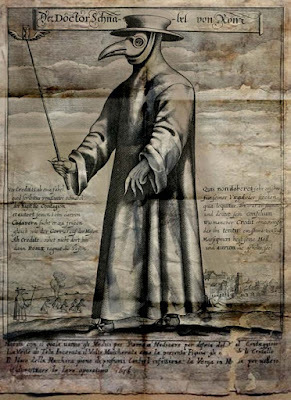 In the 17th century, it was believed that illness was transmitted by bad smells [the miasma theory] a French physician, Charles De Lorme designed this outfit. The hat is simply the badge of the physician - you knew where someone fitted into society by their headgear - royalty had crowns, soldiers helmets, nuns wore coifs, and medics had silk hats. The robe is sewn from leather or oilcloth to make it waterproof so nasty liquids, blood or whatever could not leach through onto the doctors skin. Underneath they usually wore a simple cotton robe. The cane was used to indicate things or move clothing so that the doctor did not have to touch the patient and could keep his distance. 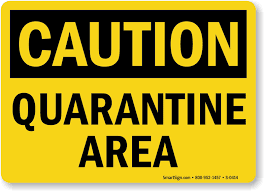 Getting back to quarantine - the word comes from 'quarantine sanitaire' - the enforced 40 days of isolation of a ship before passengers could go ashore during the time of the Black Death. In the system of maritime signal flags, plain yellow indicated the letter Q - hence this choice of colour for a warning flag. Nowadays ships fly a black and yellow flag if there is disease on board, and a plain yellow flag indicates they believe themselves free of illness and are requesting an inspection and clearance to disembark. For lots of different 2016 has not been the best year - both in the world outside, and here inside the family. 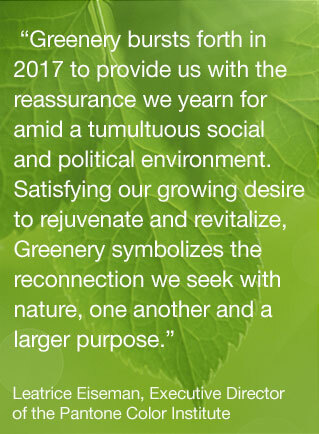 But perhaps when we re-emerge in 2017, things will look brighter. What is your best Q word? I do hope that you and your families have kept well over this festive season. One of the loveliest thing to happen this year has been reconnecting with my cousin Miriam in Australia. Looking through a box of Dad's old photos, I found a note of my ten Oz cousins, and the names of their spouses etc. 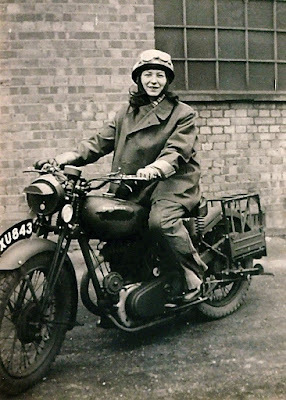 Although M is on her own now, she has kept her rather unusual surname, and typing it into Facebook revealed a picture that was clearly Miriam and my Auntie Jean [now a sprightly widow in her 90s] M wanted to know if that was her on the back of my Dad's bike, nearly 60 years ago. No, that's cousin Oriel, now a grandma up in Yorkshire! 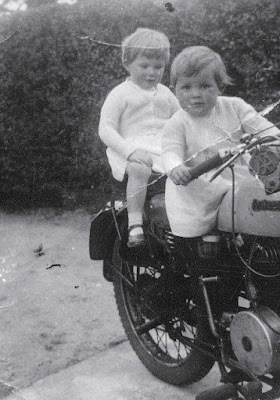 Dad loved his various motorbikes, and until I came along, Mum rode pillion. As I did, she had her own scooter in her 20s. Doris Halsall, now 96, was a wartime despatch rider. You can read her full story here on the wonderful Spitalfields Life blog. During WW2 she rode all over the place, doing her bit for the War Effort. 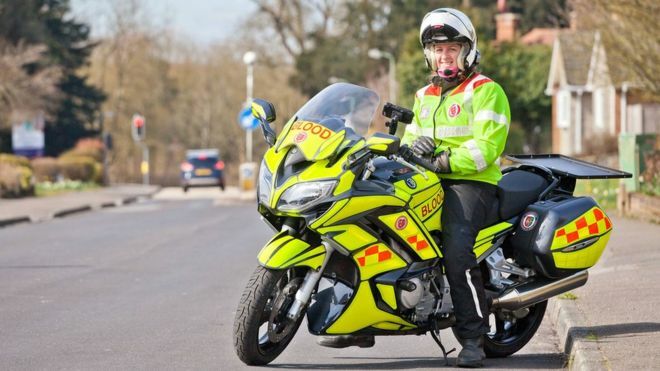 The second motorbiker is Isabelle Kydd, and I read her story on the BBC website magazine pages here She works on a voluntary basis, travelling all over the country delivering supplies of blood, surgical tools and more to hospitals everywhere, saving lives and enabling operations. My admiration for these two women is very great. Riding a motorbike takes skill, and concentration. To use such gifts for the benefit of others is a praiseworthy thing. We had to bid farewell to our red Honda this year. If you see us on two wheels in 2017, then we will be pedal powered. Bicycles will be the order of the day. But I am hanging on to my biker's thermal underwear, as I will have need of them in four weeks time. Watch out for an exciting announcement soon! I thought about this, and decided to dismantle 5 mince pies! I put the pastry into a plastic bag, and the filling into a pyrex jug. To the jug I added one large eating apple, diced. I covered jug with cling film and microwaved it for 90 seconds. Meanwhile, I crushed the pastry in the bag to crumbs. 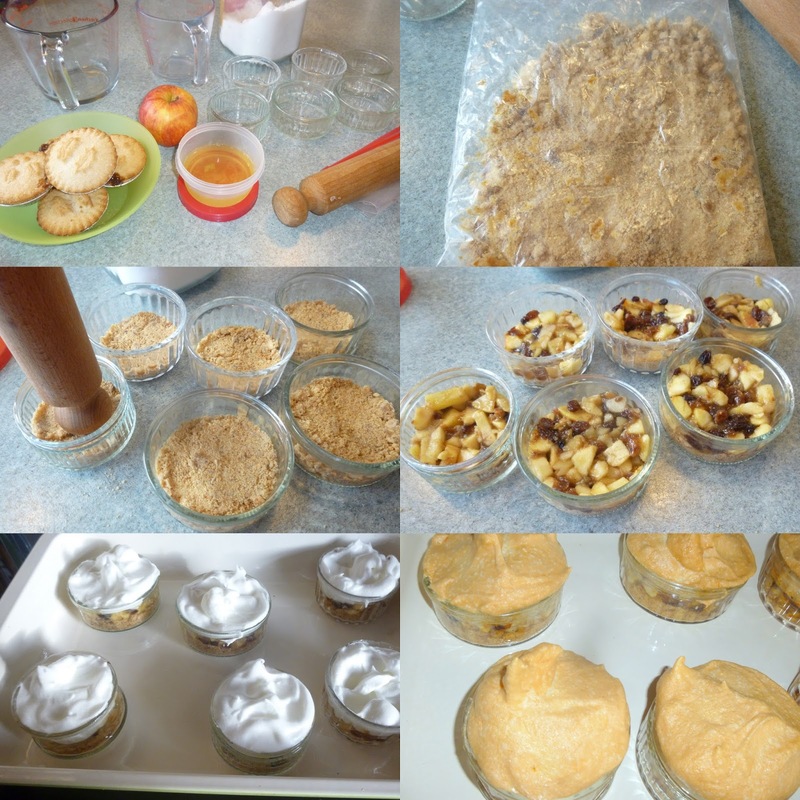 Then I spooned the crumbs into 6 ramekins and pressed things down with the end of my rolling pin. The apple filling went onto the top of the crumb base, followed by meringue [ two eggwhites beaten with some sugar] This went into the oven for about 25 mins at 150° [I think next time, I shall have the oven slightly lower] And 5 mince pies made 6 little puds! To push the envelope means to approach, exceed, or even extend the limits of what is considered possible or permissible in any context. It just isn't possible to send a personal hand-written, stamped envelope, containing a colourful handmade Christmas Card to everybody I know and love. I have many friends on Facebook, or who read the blog, some who I know well, and care about, and some I don't really 'know' but who read and comment and are somehow a special part of my life. 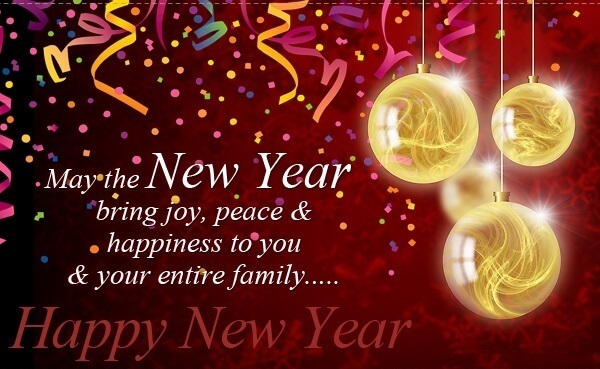 I am truly grateful to you all, my friends, for your encouragement, for your informative and challenging words, for sharing the laughter and the tears of life, for just being there. But I genuinely cannot afford the time or the money involved in cards, envelopes, and stamps. So please accept this greeting, from our home to yours. May you know peace in your hearts this Christmastide, and joy in the year ahead. Above all, may you feel love surrounding you. When I went up into the loft for the Christmas decorations, I also fetched down something from my Treasure Box, and gave it a wash. It was a little jacket I made for Liz back in the early 80s. I had bought a bag of Laura Ashley Corduroy scraps for 50p and I'd also got a remnant of plain blue chintz. I cut out a simple jacket, with a Velcro front fastening. I appliqued a skyline on the front, and the back - day and night. Liz always called it her "Sun, Moon and Stars" coat. I suspect it will still be a little too big for Rosie, but I shall take it to her at the weekend anyway. I hope that before too long, she will enjoy wearing it as much as her Mum did. I am not very good at taking photographs of events. Many of my friends and family seem to regularly post selfies on Facebook "here we are having coffee in Costa, at a concert in the 02 arena, enjoying a walk on the beach" - I usually get so caught up in what I am doing, I forget to take a picture. 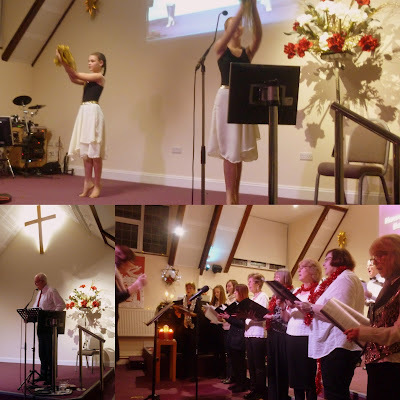 But I did remember to take just a few at the Candlelight Carols on Sunday. 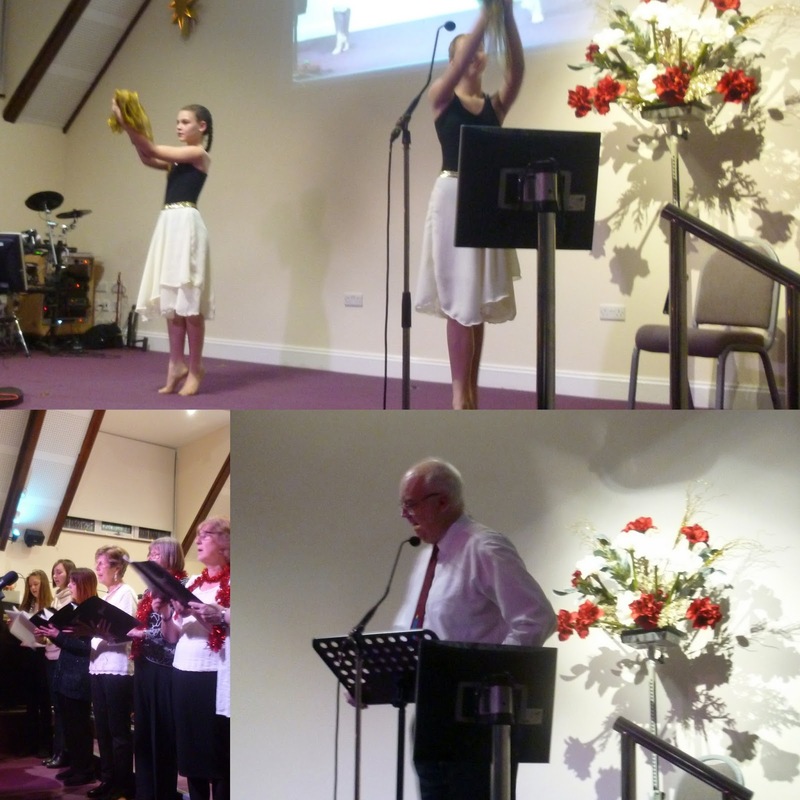 Alison with the choir singing harmoniously, the girls [in their floaty skirts] dancing beautifully, and Bob preaching passionately. Lots and lots of visitors - and loads of mince pies! That was Sunday. On Monday was the Open House. 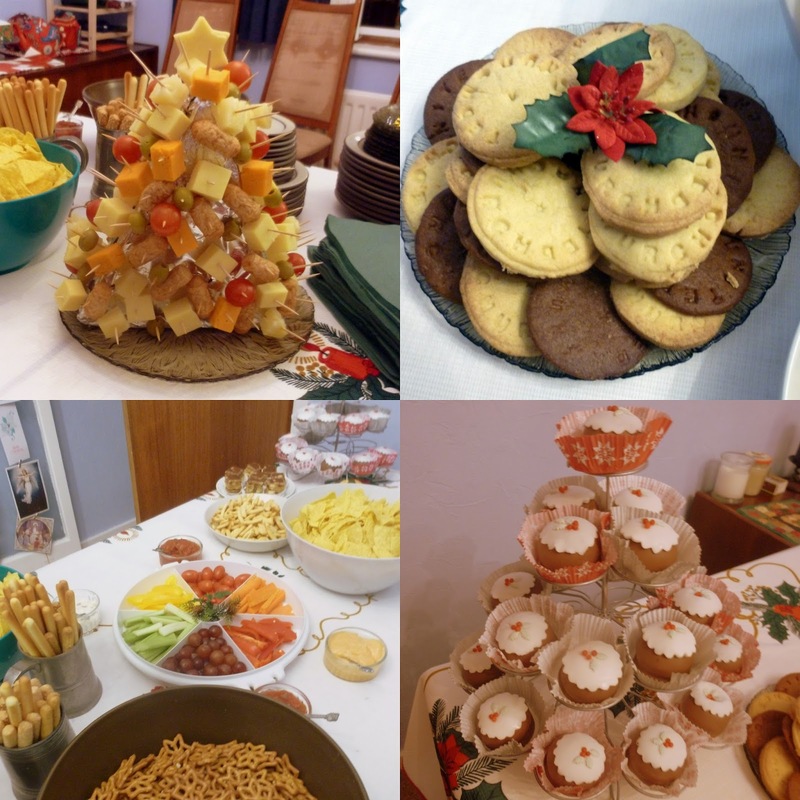 My puddings were displayed on my wire cupcake stand, and my retro 'things on sticks' went onto a Christmas tree [oasis wrapped in foil] Ruth ate the star from the top, and declared the cheese to be extremely good. It is the same brand of Lidl Cheddar they have at home - which just shows that how things are presented can affect our perception. Notice the plate of homemade biscuits. I have discovered that in Poole there is a Robert Dyas Outlet - upstairs in their little shop they sell off things which are end of range etc at greatly reduced prices. 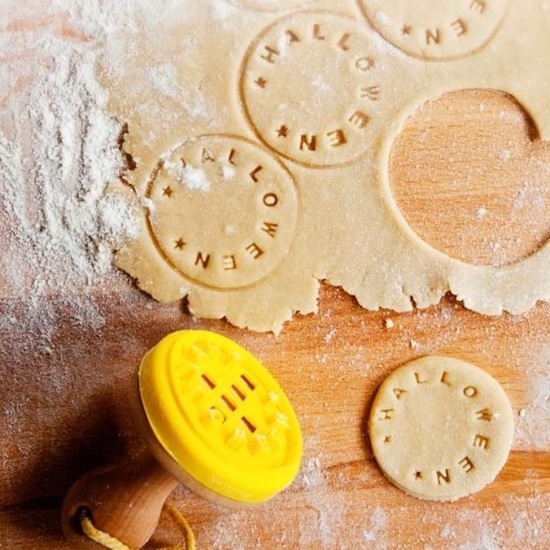 I bought a 'customised cookie stamp' for £2. This is still a bit of a 'work in progress' - I have tried two different cookie doughs - a premade IKEA ginger mix, and one of Rachel Allen's recipes. Thickness and the way it expands in the over do affect the final outcome. Unfortunately, a number of friends have succumbed to various ailments, so we did receive some last minute apologies - but we had a lovely evening nonetheless. As usual I was too busy having fun to make a record of things!! The wrappers saved from the Tunnock's Teacakes are now enrobing the PseudoRocher Chocs, ready for Christmas and Boxing Day. A delectably nutty ganache, surrounding a whole hazelnut, cased in a crispy dark chocolate shell, and enrobed in festive foils, handmade by Mrs Almond and her daughter in deepest Dorset. Three years ago my friend Lesley gave me a candle for Christmas. I declared it to be my Sunday Candle - and since then, have lit it when we are at home for lunch after Church, and it has reminded us to 'be the Light' in our community, and reminded us to pray for those we love who are away from us. 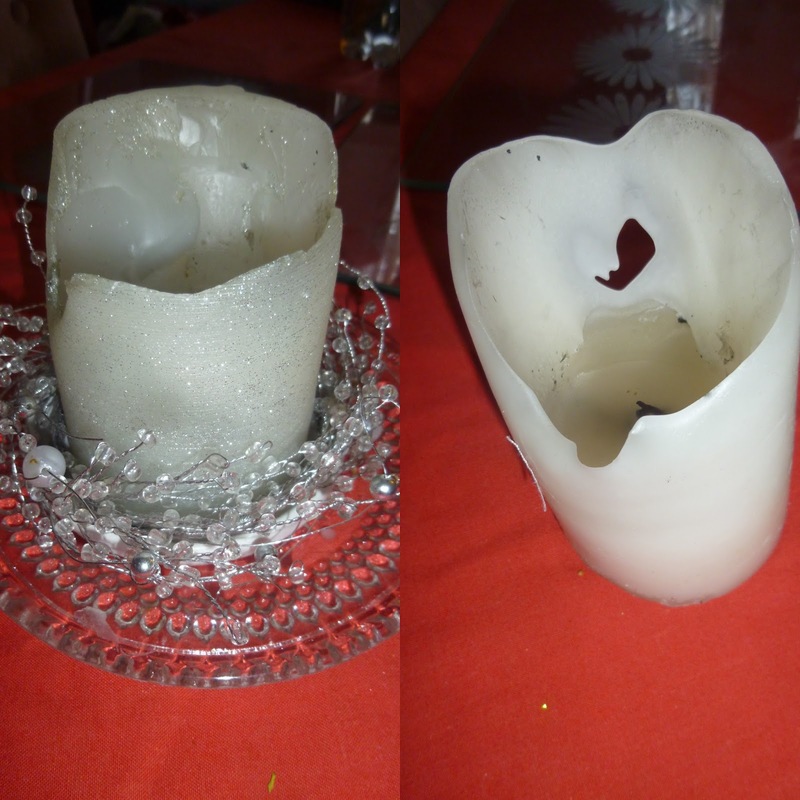 But reluctantly I have to admit the candle is no longer much use. Last week, I lit the candle, and another older pillar candle. Both extinguished themselves half way through lunch! "I think you should throw them away"
"But I was going to..."
"If you mean 'melt them down into a fresh candle' then get on and do it. Do not lest them fester in the kitchen for months"
"Candles do not fester, they wax and wane"
"Well get on with it then!" I found a Dartington Vase [wedding present 1979] which exactly fitted the china candle plate, and the little silver wreath dropped neatly round the base. 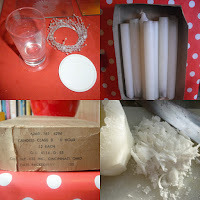 I took a couple of ordinary household candles, from the box in the garage along with the two stumps. 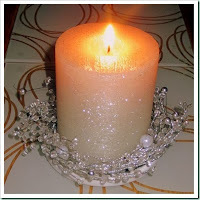 you must have proper wicks - household string is flameproof, so won't burn. Hence adding 2 regular candles to the mix, that gave me two wicks. shave the stumps carefully as that way they will melt faster. melt wax in a pyrex jug over a saucepan of water. That is the safest way, and I hook the handle over the edge of the pan. It makes it easier to lift out, and to pour. fix your wick to the base of your mould with candle putty, blu tac or a foam sticky fixer, support it at the top with a pencil/stick/skewer or something similar. Here are my two candles setting gently. I used a pretty jam jar for the remaining wax. The lid makes a useful saucer. Totally gratuitous picture of Martha Stewart Christmas Handtowel, which is hiding all the other clutter on the kitchen worktop. I am very satisfied with this bit of recycling! And a huge thank you to all our medical personnel who work so hard - many of them missing family time over Christmas to care for others. And long may the NHS continue to be always free at the point of need and always there for everyone. "Doing December Differently". It is so perceptive - many of us find that the joy of Christmas is tinged with difficult moments, that even the happiest of families may have sadness. In this final Pause In Advent, I want to stop and remember those who are struggling - and remind myself that the message of the angels wasn't a chuckle and an ephemeral "Ho ho ho!" - but a resounding chorus and a lasting "Hope! Hope! Hope!" 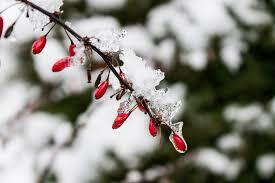 Let the bells jingle but make time for tears to fall. Eat, drink and be merry but do not go hungry in that inner place. Rest, reflect and remember, Be true to yourself. Many of us can't play happy families at this time of year. December is for divorce as well as decorations. December is for death and dying as well as discos and dancing. even those in the same room. Disappointment in December is especially hard to bear. Sometimes the light no longer shines in the darkness. The desolation swallows us up and we die a little. can drown out despair and kindle determination to move on. Dig down deeper than the tinsel to the place where hope is found. Maybe, just maybe, the flickering flame will be fanned gentle into fire. 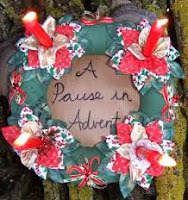 Whatever your personal situation this Christmastide, above all, may you be blessed with a sense of the peace that passes understanding, and the knowledge that you are truly loved...and thank you to all the other bloggers who have joined in these 2016 Pauses, whether in writing, reading, or commenting. That's this year's cake iced and ready. I shall put my Prophet, Priest and King candle alongside it too. This is so easy and looks so effective. Simply roll out fondant icing very thinly, and cut out a frilly edged circle. 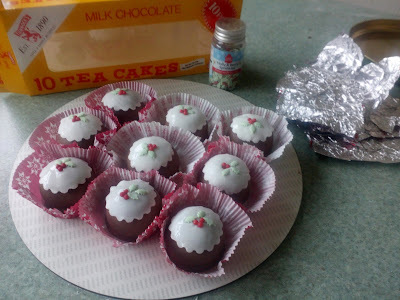 Brush the top of the tea cake with a little water and apply the white icing. Now put a little more water on the top. Add leaves and berries from a pot of sprinkles [Sainsbury's] That's it! 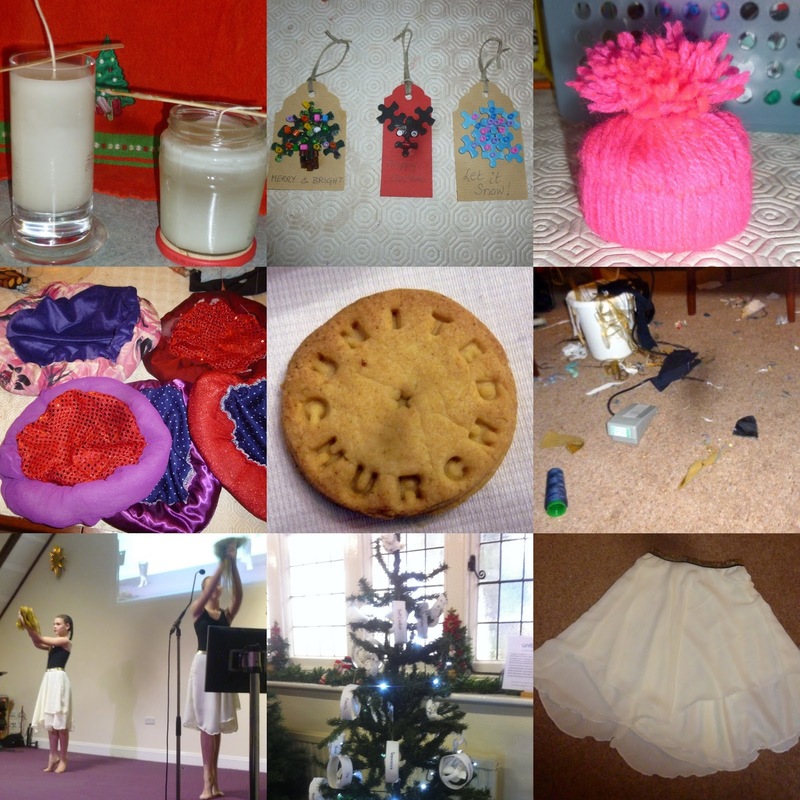 Kirstie Allsopp eat your heart out. Have A Slice Of Hygge!! 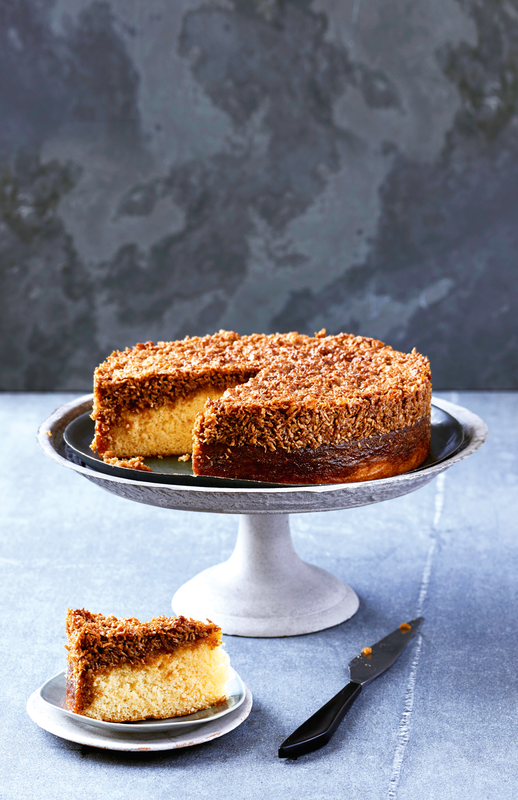 Simple Things magazine is still going on about hygge [I thought Mags and PomPom got that all sorted a year or two ago] and recently mentioned something called the Danish Dream Cake. 2 In the bowl of a food mixer, whisk the eggs, caster sugar and vanilla sugar on high speed for a few mins, until white and light. Meanwhile, in a separate bowl, sift the flour and baking powder together. 3 Carefully fold the flour into the egg mixture. Mix the milk with the melted butter in a jug and carefully pour into the batter, folding it in until incorporated. Pour the batter into the prepared cake tin. 4 Bake for 35–40 mins or until almost done (try not to open the oven door for the first 20 mins of the total baking time). 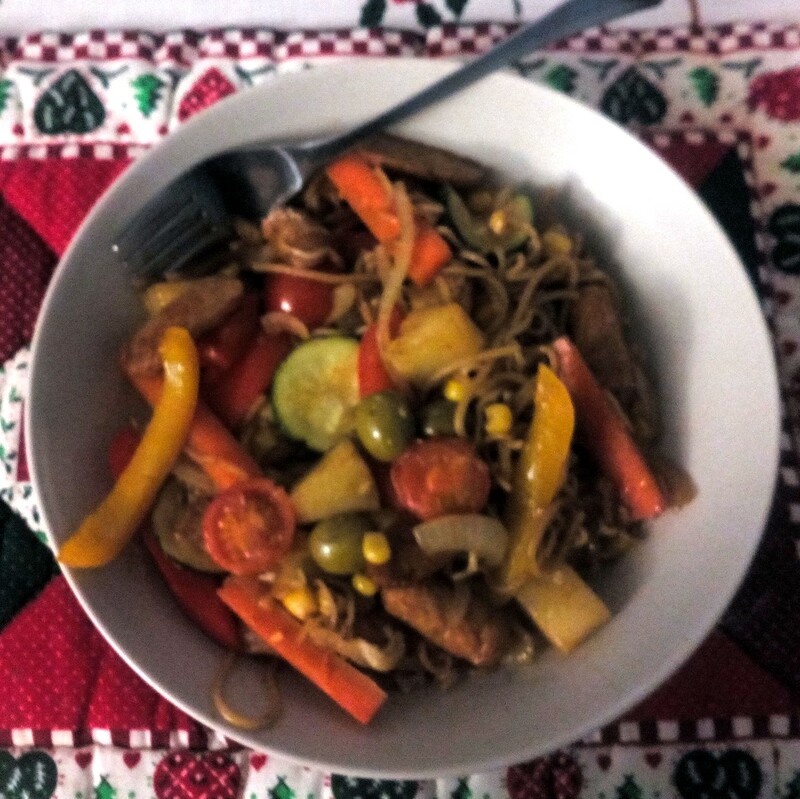 5 To make the topping, gently melt all the ingredients in a saucepan together. 6 Remove the cake from the oven and carefully spread the topping all over the cake. 7 Return to the oven. Turn up the heat to 200ºC/Fan 180ºand bake for a further 5 mins. Allow to cool before eating. 8 You can freeze it – slicing it first is a good idea. 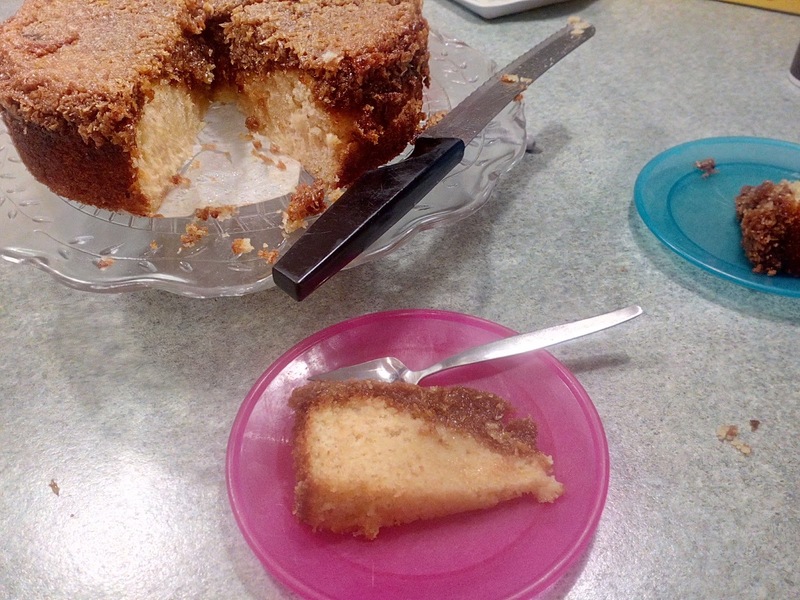 I am extremely pleased to announce that it tasted delicious, and mine looked just like the one shown in the ST recipe! I am not sure about the cake's name - I rarely dream of coconut.The sponge was pleasantly moist without being too dense, and the topping had a lovely toffee-ness to it. Steph's just spent a few days with us - we hadn't expected her to visit before Christmas, but it has been great having her around. On Tuesday we went to Minstead and Ringwood, and took her for lunch in BH24. The more I sample from their menu, the more I enjoy it! 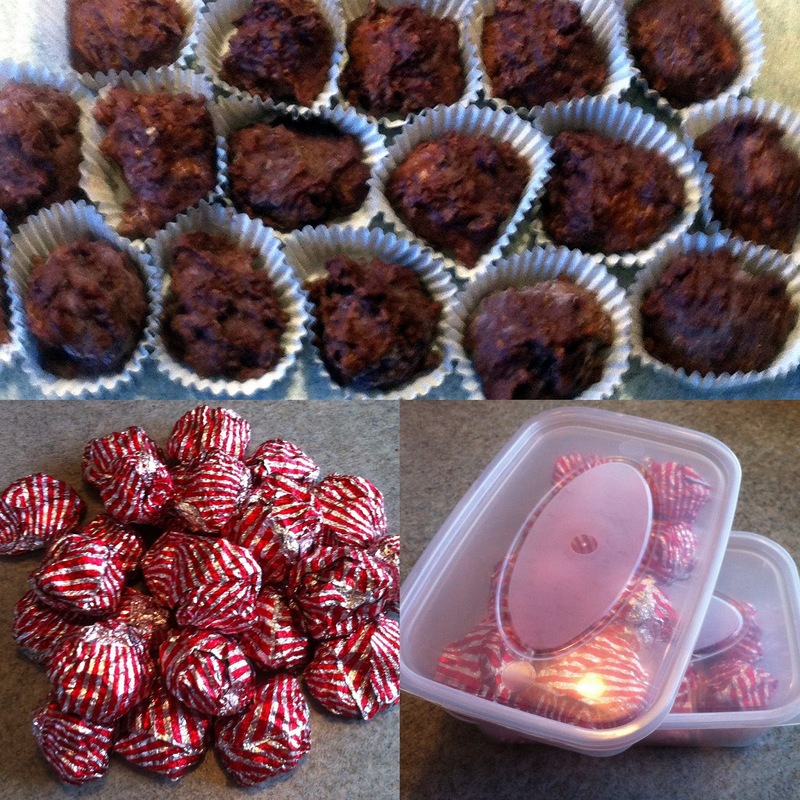 In the evening the pair of us cooked up a batch of Christmas treats from the Sainsbury's website. We used plain chocolate rather than milk. Gorgeous! We made nearly 30 - but after the obligatory sampling we had these 25 left. As well as much giggling together in the kitchen [I had chocolate all over my face, Bob tells me] we also began working together on my Christmas Jigsaw. This was £2 in a CS some months ago, and Steph is very good at the London Underground - we have all the stations and lines in place - now just the white pieces and the edges remain. And finally, our mother-daughter bonding included a session with Jamberry NailWraps. Steph fixed me up with the 2nd set of wraps I had from Bob for our anniversary. Slightly crazy, and very festive! 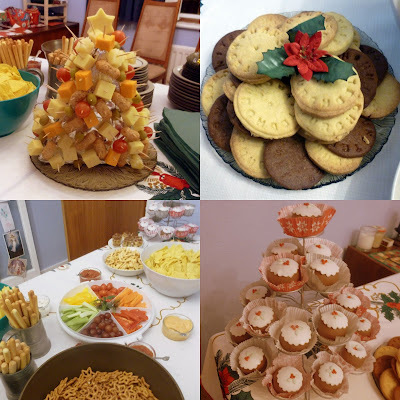 Meanwhile Liz in London is busy planning our family Christmas lunch - she is in charge this year. Feeling so blessed to have two such loving daughters. This is probably too late for Christmas 2016, but you may want to file it away for next year. I was talking with Miriam, our brilliant Youth Minister about Tiddlers[our Toddler Group] who will be having a brief Nativity Service this morning. 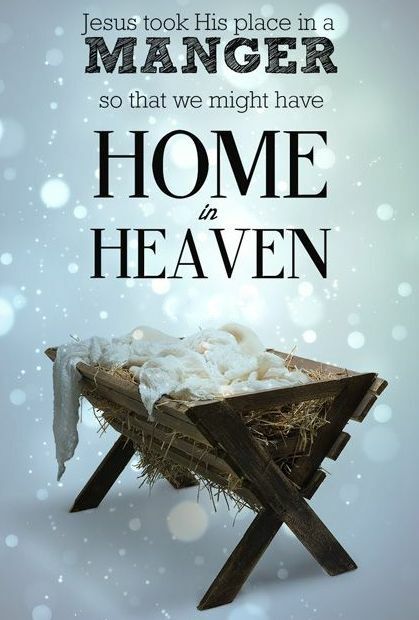 For the 10 minutes that the children sit round the manger and sing a couple of songs, you don't want to be spending just as long getting them in and out of costumes. I remembered that at almost any museum I have visited lately, there's a basket of headgear so children can put on a hat and pretend to be a character. What about a basket of Instant Bethlehem Hats? Instant Turbans for Eastern Magi - draw round a 7"/18cm plate and cut out a circle of fabric. Zigzag/overlock the edges. Now cut a strip 24"/60cm long and 6"/15cm wide of matching or different fabric, and a second piece the same size, from wadding. Right sides together sew a seam down the long edge of the fabric to make a tube. Turn inside out. Stuff this with the strip of wadding. Wrap round into a ring, and sew the ends together. Put this on the circle and handstitch round the edge. Having no child's head to model this, here is one posing on the fruit bowl on a glass vase, and you can see all the others I made below. 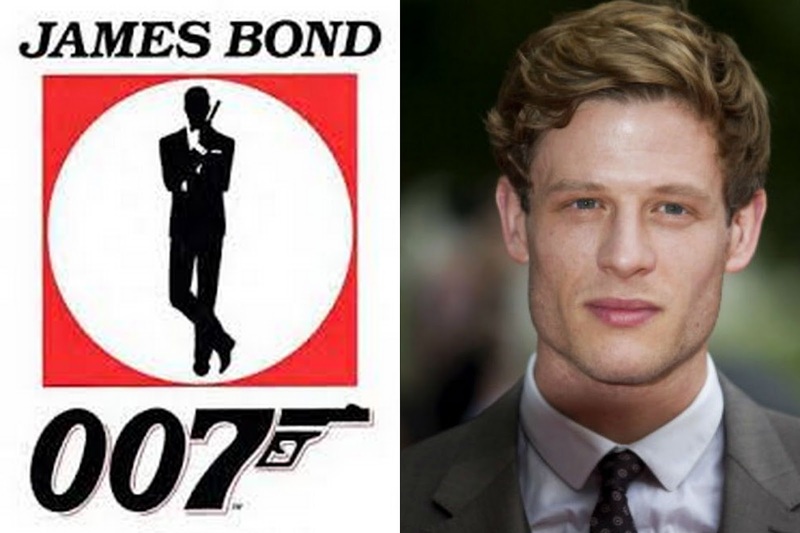 I admit to being especially proud of this one. I should have patented it, because I have never seen this elsewhere. I can do the traditional "rectangle tied on with a strip of cloth", and the neat and nifty "teatowel-edge-rolled-round-a-shoelace-and-tied-on" but this one is even quicker and easier on the day. 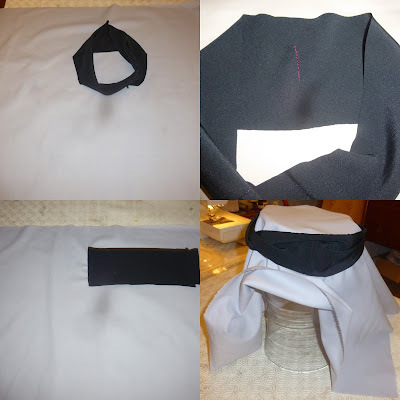 Cut your base cloth about 20"x30" [50cm x 75cm] or thereabouts. Or use a tea towel. Now cut a strip of cloth 24" x 3" [60cmx8cm] - preferably something with a little bit of 'give' eg tee shirt fabric, jersey etc. 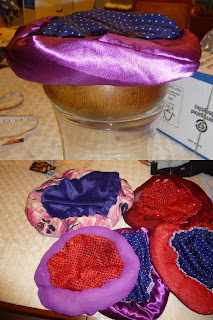 Overlap the ends by 12/2.5cm and sew into a ring. When you drape the cloth over the child's head [or fruit bowl] you can then ease the 'holding ring' down and it will keep the headgear in place. They work really well, and there's no bits to come adrift, and no pins. Pantone have just announced their Colour of the Year for 2017, it is called Greenery. 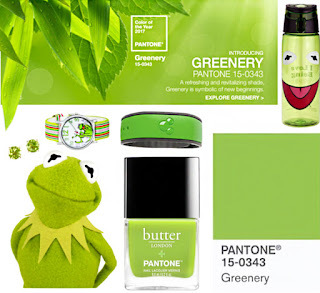 I quite like this shade but it does remind me of a favourite froggy friend! Lelaine and Rebecca are doing a dance at the UCF Candlelight Carols, and I've been drafted in to make their floaty skirts [with gold sequinned waistbands, and gold scarves] I didn't bother to photograph the innkeeper's robes and all the shepherds' tunics. 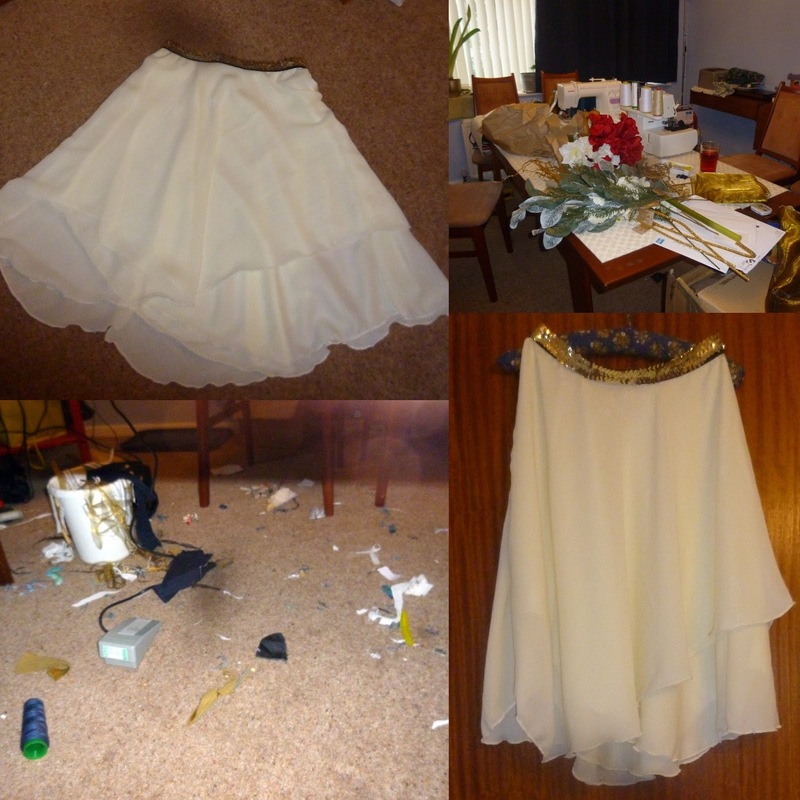 But thank you to all of you who have sent messages of appreciation for my costume tutorial [and your lovely photos too] It's great to know that they can be of use to others. You can see how much fabric is in the dance skirts when they are laid out on the floor - the Burda pattern was weirdly asymmetric and quite a challenge to put together especially as L&R wanted 'no zip, just elastic at the waist, please' But we got there in the end! So St Mary's were offering a free craft table for children, and giving out chocolates and invitation leaflets. UCF were giving out free children's storybooks, invitation leaflets and candy canes. [Please do not lecture me about dental issues, I reminded every child to brush their teeth afterwards!] Each candy cane had a little story attached. Here is a Candy Cane – always so popular at Christmas. 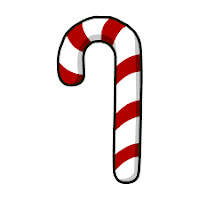 There is a story that the Christmas Candy cane was originally invented by a Christian confectioner who wanted to make a sweet that was a witness to his faith in Jesus. He made some candy, bent into a J shape – J for Jesus. But held the other way, it is a shepherd’s crook – shepherds came to see baby Jesus, and Jesus is often called the Good Shepherd. 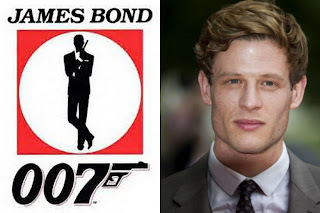 He made the cane from a boiled sugar – which we often call ‘rock’. Jesus is the Rock we can depend on. 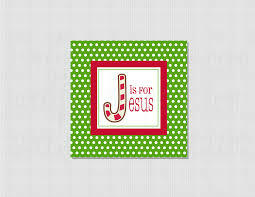 The peppermint flavour is fresh – Jesus gives us the opportunity of a fresh start in life, whatever mistakes we’ve made. I know, it is just a story, and rather contrived - but it's nonetheless a good way of explaining the basics of the Gospel Story. And sweets make the children happy. Week 3 of Advent, Gaudete - Joy and Jesus!